The StratoShuttle 1 pod, launched from Cheesefoot Head (near Winchester) on 28.11.2011, was the result of a Faculty of Engineering and the Environment fourth year student group design project. 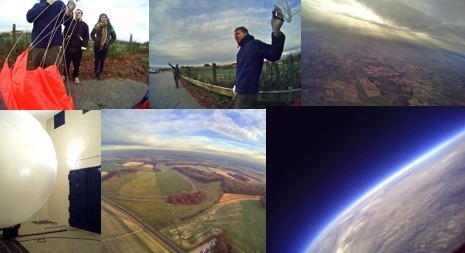 The aim was to lift a small instrument package into the stratosphere using a helium balloon (the pod carried a camera, which took the images shown above). The secondary goal was to validate our trajectory prediction models, which, given an up-to-date atmospheric sounding (performed shortly before the launch) generated a forecast of the flight path of StratoShuttle 1. This flight also served as a test of our payload retrieval technology (once the balloon reaches its bursting altitude, the payload descends on a parachute, at the same time drifting in a direction and over a distance determined by the winds aloft).